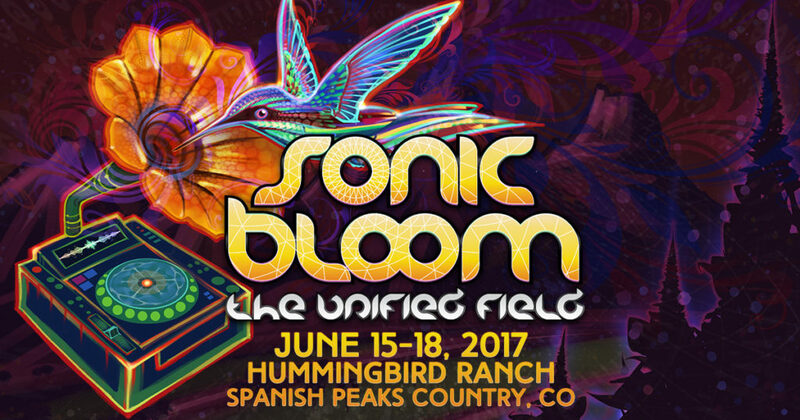 Sonic Bloom is a festival we plan on going back to year after year, regardless of the lineup. We were thrilled to see that it featured a taste of many artists both familiar and new. However, this festival is much more than the music. What really sets it apart from the rest is the venue, flush full of blooming flowers. 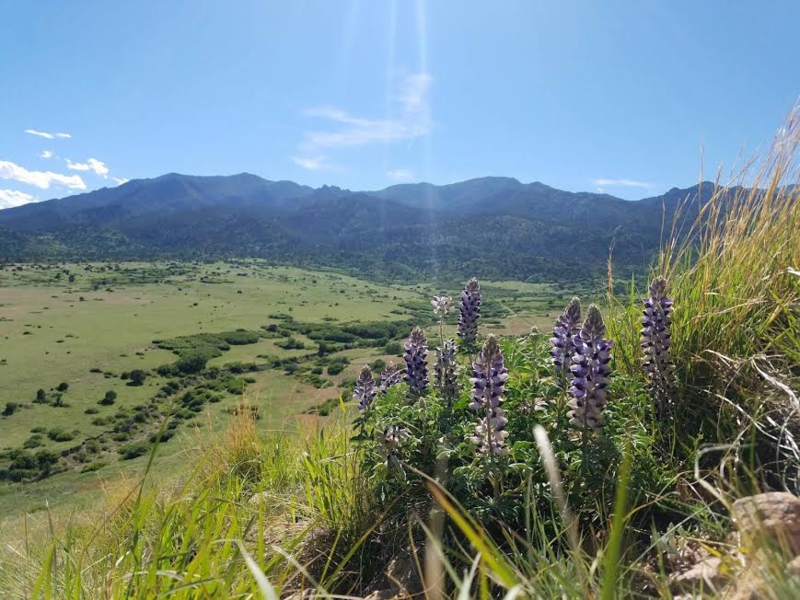 It features exquisite blue and white Lupines, fire-red Indian paint brushes, wild roses and an assortment of other wildflowers decorating the festival grounds. All this floral action blooming across the prairie was set against a backdrop of the snow-covered Spanish Peaks. 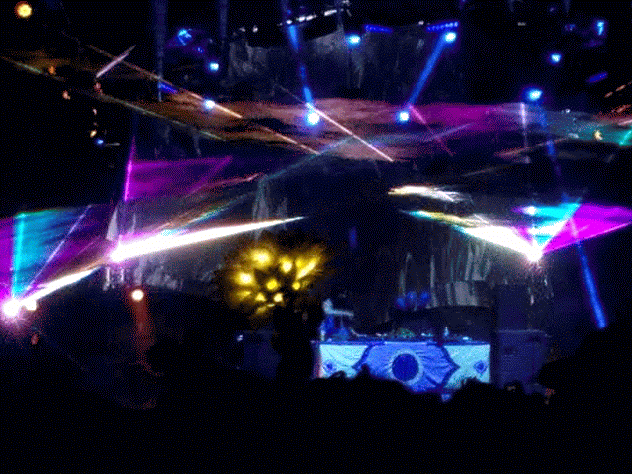 Let’s just say this festival and the views brought to life the name Sonic Bloom. One unique feature of this festival is the creek that flows through it. The creek offered a shady area to cool off, jam out in your hammock and unwind, and if you were lucky a glimpse of a hummingbird. The freshly melted snow from the nearby mountains provided a chilling refreshment for those in need of a cool down. The wooks, gypsies, and festies at the creek were respectful and made sure not to disrupt their neighbors with loud noises, offensive smells, or general unpleasantries. We considered the creek to be our camp away from camp and we set up a hammock that we could head back to for a moment to unwind, take a midday nap and restore our energy. I highly suggest that next year you bring a hammock to set up by the creek, you won’t be disappointed. On Sunday we hiked up one of the nearby hills to reflect on Sonic Bloom and we experienced a remarkable journey through fields of flowers. We ascended, emerging at the top with a breathtaking glimpse of the entirety of the festival grounds. This was a humbling experience as it let us look at the festival activities from an outside vantage point. We were reminded that we are but two of the ~4000 people that make this festival unique. Some of the art was familiar and recognizable from other festivals like Tucson Gem and Jam, such as the LED display shown below. 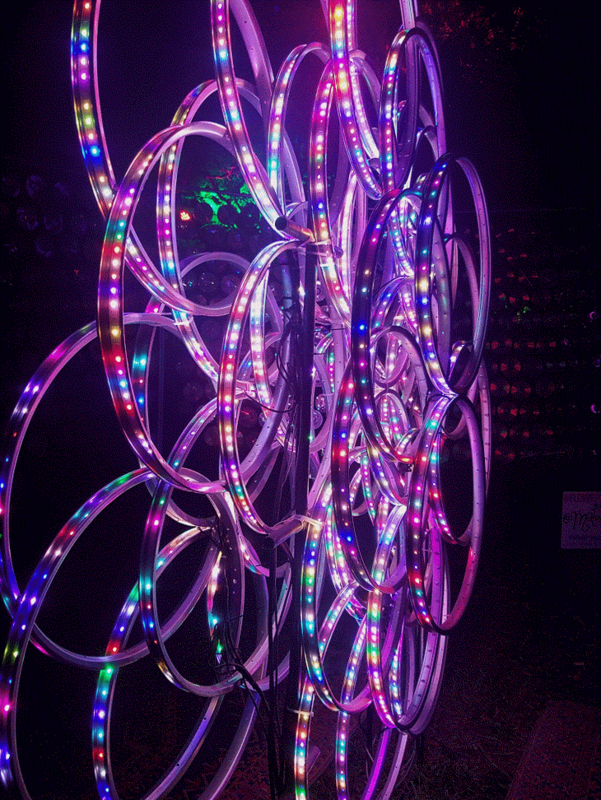 We love how this artwork shows off the engineering of the technology Astral Hoops uses. Throughout the festival, there were live painters unfolding scenes never before exposed to anyone else. The live painters let the music affect their paint strokes and gathered around the hummingbird stage. Many of these painters had their artwork on display inside of the gallery. While we would have loved to buy one of the original pieces of artwork for sale, we are not yet ready to afford to do so. Instead, we looked a little bit more seriously at some of the prints but ultimately left empty-handed due to indecision. The Hummingbird stage featured a carved hummingbird on the front allowing for spectacular images to be mapped onto its surface. This stage was familiar to us from when we saw the Desert Dwellers and Kalya Scintilla show last January at the Ogden Theatre in Denver, CO. The hummingbird appears to be hovering and furiously flapping its wings back and forth, as trippy projections take flight across this stage. The hummingbird became animated as it was brought to life with house beats playing at this stage all night long. Music began to flow in the midday and went through the night all the way to sunrise. Whitebear welcomed the sun as it rose on Saturday morning and Plantrae had the honor Sunday morning. While we can’t say we made either of these sets due to the bed calling our name, we listened to these sets while embracing each other in a warm snuggle. I wish we were not so exhausted so that we could have fully experienced the set by Whitebear. However, when the party runs until sunrise I can’t help but feel justified in my choice to sleep before the sun fully wakes up. No festival is complete without picking up a new artist to listen to on SoundCloud. So Down left with an impression on us, earning them a spot on our play list. The drama, the depth, and progression of the filthy-funk blended together flawlessly with trap, dubstep, industrial, and freestyle rap. So Down is the definition of creative individuality, saying to hell with copying the other stages rhythms. To try and box their jams into a set of genres is as unfair as grading future worth with an A, B, C grading system. Style comes without boundaries and So Downs’ music weaves together the genres into one genre: music. The Meadow stage, while not as elaborate as the other two stages caught us by surprise. We went to see Yheti throw down some wobbly beats filled with elements of glitch, space-age, psychedelic melodies and a lot of experimentation. Yheti’s music is hard to describe as it is as diverse as the crowds that go to see it, but let me try and come up with a metaphor for it. Imagine you locked an avant-garde or surrealist painter in a room and took away all of the paints and canvases replacing them with a computer, a synthesizer and a sound library that parallels in size to the Library of Congress. What do you get? Yheti, who we consider to be a wizard of the soundscape, a demigod amongst DJs. Next up on the stage was ill.gates, arguably our favorite act of Friday night. With lyrics and rhythms that hit you like kickboxing class taught by Bruce Lee himself, it was hard to stand still for a moment to catch our breath. The precision, speed, and diversity in musical notes hitting our eardrums made us “Bounce” about the crowd. The collaborations that went into his new EP are second only to his previous EPs, and the crowd ate his music up like a hungry house cat and a big ol’ bowl of kitty kibble. The funk, the strength, the bass and positive vibes were elements of his set that left us yearning for more. While we can honestly say we went into his set not sure how we felt about his music, we left big fans. If anyone could turn us into a belieber, it would be ill.gates. Not to say we hope he tries, but I know ill.gates could make it work. A little bass, a little funk, a little Justin Biebs? Whatever you throw at us ill.gates we’re ready to dive face down into that swimming pool of good vibes. The Bloom stage have the vibes of a vaudeville theatre going beyond just musical mastery and into the realms of visual enthrallment. With audio-theatrical artists like the Desert Dwellers and the electro-galactic sounds of Space Jesus, our ears, eyes, skin, and bones all were picking up frequencies. Our eyes were visually stimulated not only by the circular array of floodlights, laser beams, and projected visuals, but the performers took this show to new heights. With fire staffs LED hula hoops, silk ropes and dancers there was a lot of flowing going along with the music. The rainbow of laser beams was spectacular but they were not fully appreciated unless you glanced backward. If you turned your head and looked up at the sky the beams danced about, forming shapes, patterns and even wrote “Sonic Bloom”. How cool is that? With the transcendental music that Kalya Scintilla and Desert Dwellers brought to the stage, it was hard not to have a spiritual moment. The stage performances by these artists embraced the audience’s souls and created an environment of peace and love. If you want to fully appreciate the Desert Dwellers or Kalya Scintilla you may do best by immersing yourself into one of their shows. The whole set is like a book coming to life unfolding page by page onto the stage. The theatrics, fire poi, storytelling and a lot more is missed in translating a live performance into an MP3. If you haven’t seen either of them I advise you seek out a performance and mark it down on your calendar. The performance by Space Jesus was out of this world, but what else would you expect from a messiah not from this planet. The electro-galactic sounds flowing from the PA system are best described as future-industrial and extraterrestrial-melodies. With metallic, organic, frequency changing beats, Space Jesus introduced our world to truly foreign sounds. These beats were best absorbed through your skin and into your bones to be forever embedded into your soul if you took his advice. At his urging, we felt free to take off our spacesuits, lightening our body and mind of those things holding us back from experiencing the moment fully. When we thought the experience was nearly over Space Jesus introduced us to his friend the Bloom Man Group. The Bloom Man Group had three blue heads attached to one body and by the looks of it Space Jesus must have brought him down just for Sonic Bloom. Rumor had it by the end of the night the FBI was already frivolously hunting down this Alien. Bear with me for a little while as this experience really pulled at my heartstrings. While hammocking with John along the river I witnessed a woman storm to her campground in a flood of tears. I went over to comfort her and asked if she was okay despite it being clear that she was in a world of emotional stress. I offered her a hug and she met me with one of the warmest, most sincere hugs I have ever experienced. We embraced for a minute or two and she calmed down enough to tell me why she was not having a better time. She told me that she and the guy she had been seeing were in a fight that had lasted all morning long. Her deep distress was clear despite the fact that before coming to the festival they had agreed that their relationship was winding down. She told me that he has a lot of energy that comes off very strongly and that, the powerful energy was what initially drew her in. She told me that the energy he is composed of is amazing when directed into his artwork. She passionately told me that when that energy is expressed towards a canvas magical imagery begins to form as the paint pours forth in a representation of his mind and soul. She then told me that lately that energy had turned on her, pouring forth from him in a stream of raw, crude, and offensive comments. This brought me back in my mind to Gem and Jam, a festival that myself and John went into struggling with many aspects of our relationship. Our words began to unfold as we expressed to one another our frustrations in the relationship and eventually both of us said some things that we didn’t fully mean. Luckily our good friend Anne was there to comfort us and reassure our tear fills faces that she would help us get through this experience. And she did help us work things out, THANK YOU ANNE! Everything eventually worked out for us, however, there was a night when I thought to myself, you stupid idiot, you are going to lose the one I love most. That experience pushed us to be even stronger and more confident in our relationship and ability to overcome obstacles in our lives that bring us displeasure. I let my new friend know about this and how myself and John have come to the realization that day one of any transformative festival we attend will be focused on finding what it is we need to transform both in ourselves and in our relationships. Everyone has stressors, such as jobs, school, health, chores, and body image and we have come to the realization that the most proactive thing you can do at a festival is to express your struggles to a loved one. That trusted soul should be someone that will guide you away from your struggles and transform your outlook on the world. After quite a bit of talking with her, the guy she was seeing came back to camp and they began to talk, albeit in a calmer manner. I left to go snuggle with John in the hammock some more and we relaxed for a little while. Later, when I was craving a super heady taco I left the hammock and invited her to come along with me to grab a bite to eat. She agreed to come along, but stopped by the permaculture action committee tent to see what class was being taught next. When we got to the tent it was exactly 230 which is when a class on conflict resolution was being taught. She told me that she wanted to attend the class instead of getting a taco and I wholeheartedly agreed it was where she belonged. I continued on my journey towards Super Heady Tacos and grabbed a bite to eat. Well a bite might be an understatement — who am I kidding, I stuffed my face like a child at a chocolate fondue fountain. After getting my fill of a delicious Lightning Tacos I continued back to camp to retrieve a special gift for my new friend. 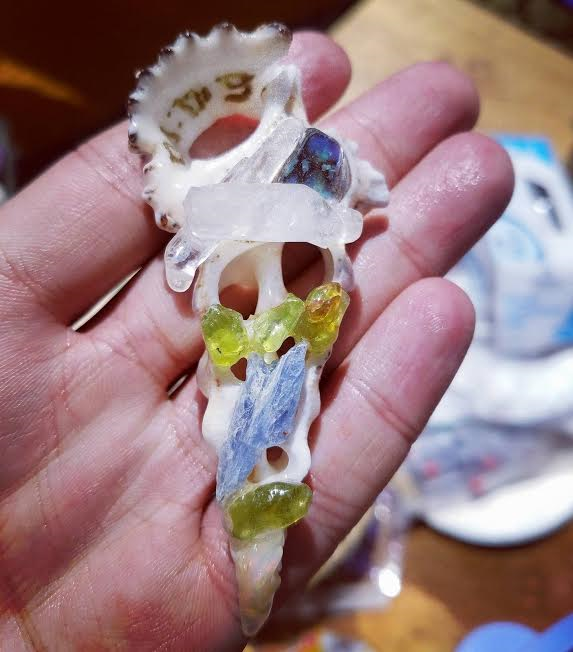 I went carefully selected one of the Space Time Crystal pendants I had previously crafted and poured special intentions into the sea shell and gem stones. I chose one with kyanite to promote soothing of the soul, communication and the repairing of a damaged friendship. The pendant was also chosen as it features quartz which can be used to clear negative energies, and cleanse the soul. Finally an opal was included on this pendant to bring forth feelings of love, imagination, and creativity. I knew this gift would be well received not only for the healing properties but also since she was wearing a similar shade of blue and sea shell gauges in her ears. I brought this gift to the permaculture action committee tent and slipped it into her hand before departing to let her finish the class on conflict resolution. Later that evening I said hello to her once more, and pleasantly observed that she and the guy she was in attendance with were together. They were speaking calmly, and seemed to be doing a world better than they were when I met them. I wish the best for them and for their future friendship and/or relationship. And I feel blessed to have been able to comfort her when she was feeling the strain of her relationship, as Anne had done for me at Gem and Jam. This was the highlight of my experience at Sonic Bloom as I feel I helped her have that transformative moment that is really what these festivals are all about.